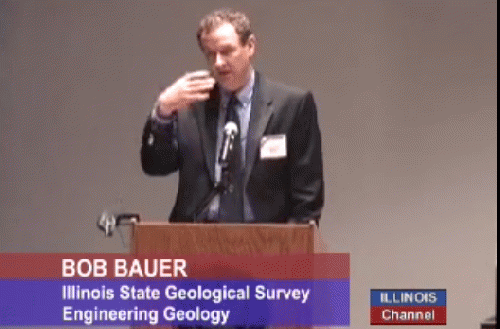 What: Robert Bauer, an engineering geologist at the Illinois State Geological Survey, will speak about oil/gas well construction, providing a brief history of horizontal wells and the hydraulic fracturing process, seismicity, results on contamination studies in the United States and where shale oil/gas resources may lie in Illinois. When: March 12, 5:30 p.m. to 9:00 p.m.
Robert Bauer is a busy guy. Shilling for the oil and gas industry is his assigned task. Today he brought the pro-fracking message to Bloomington, Illinois. The problem with these appearances stems from the organization that sponsors Bauer's pro-fracking message: the Illinois Prairie Research Institute. Though the organization's name suggests it conducts research that should be unbiased and scientific, an examination of the Institute's funding sources suggests the think tank has more ties to coal, oil, gas and nuclear energy than it does to groups who look critically at such energy sources. Bauer has stated that studies of eastern fracking sites reveal no ill effects to water supplies. "The best studies are the studies where folks go in before drilling and do sampling of the water supplies and groundwater wells in the area, and then after hydraulic fracturing and drilling has taken place, do additional sampling afterwards," he said. "Those type of studies have shown no contamination from these drilling operations, and that is what's required for their permits (in the new act.)" Eleanor Black, "Fracking Makes Its Debut in Illinois Under the Strictest Regulatory Laws in the U.S.," Daily Illini, October 24, 2013, http://www.dailyillini.com/news/local/article_ccff98ce-3c55-11e3-8440-001a4bcf6878.html. Accessed 3-12-14. Critics of Bauer's position note that the timing of the post-fracking water sampling carefully avoids those times when the most radioactive and chemically laden liquids will flow back onto the fracking site.